What is Atmospheric Pressure? Pressure is defined as the force acting per unit area on an object. Due to the Earth’s gravity, all objects on or near the surface of the Earth experience a force that pulls them towards the center of the Earth. This force depends on the mass of the object and in case of solids it is measured and called the weight of the object. The same force also affects gases but due to the fact that their particles are spaced apart from each other and in constant motion, the term weight is substituted by the term Pressure. Atmospheric Pressure is simply the pressure that is exerted by the Earth’s atmosphere composed of different gases, on the surface of the Earth or any object on it. Factors affecting Atmospheric Pressure: The principles ofmeasuring atmospheric pressure at a point are similar to the measurement of liquids in which the pressure depends on the density of the fluid and the height of fluid above that point. The atmospheric pressure at sea level is taken as a reference point for the value of atmospheric pressure in most cases. 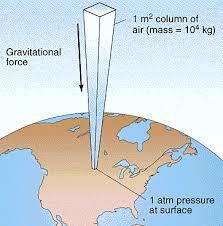 The average atmospheric pressure at the surface of the Earth is around 1.01 x 10^5 Pa which is termed as 1 bar. Atmospheric pressure decreases as the height of the location increases because of the decrease in the Earth’s gravitational force and the fact that the mass of air above that point is lesser than at a point below it. Atmospheric pressure also depends on the temperature of the location because a part of the force exerted by gases is because of their random motion caused by kinetic energy. At higher temperatures the molecules possess more kinetic energy thus exert a larger force. Measuring Atmospheric Pressure: Atmospheric pressure is measured using an instrument known as the barometer. 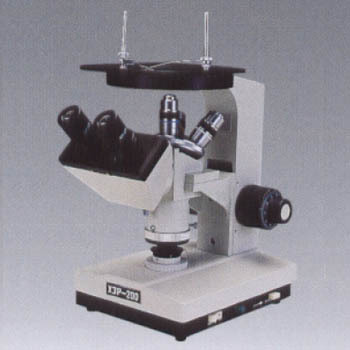 The simplest form of the barometer consists of a long tube closed at one end and with the other end in a reservoir of mercury open to the atmosphere. The atmospheric pressure causes the mercury to rise in the tube until the weight of the mercury column is equal to the force exerted by the atmosphere. This is the reason sometimes atmospheric pressure is given in terms of inches of mercury or mm Hg.